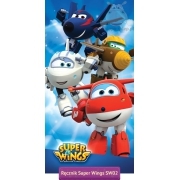 Super Wings bed linen, towels and accessories collection with kids cartoon characters for children with super aircraft. 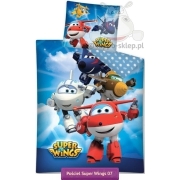 Super Wings is form of aircraft that specializes in delivery of special parcel for kids around a world and, depending on needs, transform into robots and everything to quickly and efficiently deliver packages worldwide. Kids bedding, towels and accessories with the characters of the Tv animated series: exceptionally fast Jeet, flight controller Jimbo, sky-flying acrobats Jerome, handyman Donnie and Dizzy girl rescue helicopter. Super Wings series characters bedding and accessories are the perfect idea for a practical gift for all small children’s TV series fans.